Not far from a rare and protected seaweed dyke is Sprove Barrow. 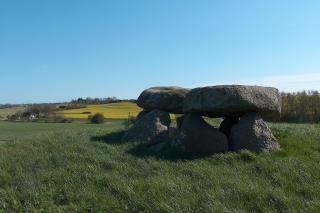 The barrow is made up of a long entryway paved with stones, and two boulders barring entrance to the burial chamber itself. Bronze Age cup marks pock the boulders, but the barrow dates back to the late Neolithic Age, probably between 3300 and 3200 BC. Originally, a layer of earth covered the burial chamber and the boulders. Shards of clay vessels covered with attractive patterns have been found in front of the entrance and are believed to stem from ritual offerings to the dead. They bear witness to the burial rituals carried out by people of the Neolithic Age. In the summer of 1984, I was working to restore Sprove Barrow. Although one of the boulders at the entrance was cracked, the task didn't appear dangerous. I began working without giving it a second thought. One day, though, I found myself working with my torso in the entryway, the cracked boulder on one side, and a similar, equally large boulder on the other. A voice in my head that felt as if it came from within the earth somehow told me to pull my head and torso out of the entranceway. I had barely got out when the cracked boulder toppled, smashing into the one opposite it. Had I still been there, I'd have been history. But, because I listened to the voice from the underworld, I'm still alive to this day, restoring barrows and passage graves.